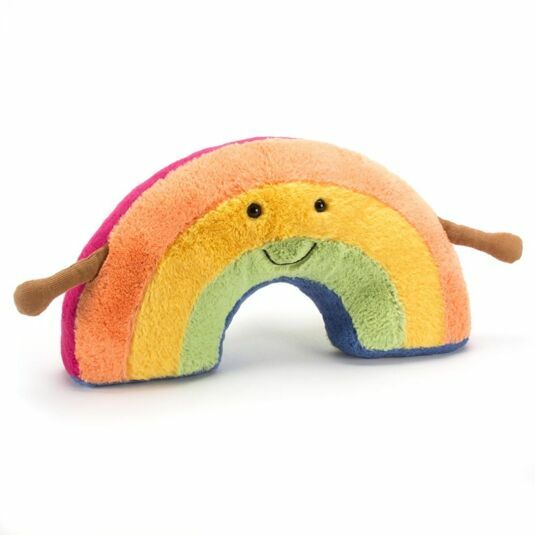 Who needs a pot of gold when you have Amuseable Rainbow – the happiest rainbow of all! He has outstretched arms, ready to shower everyone and anyone with loving hugs! He is super soft and squidgy, perfect for cuddling up to and sure to put a spring in your step thanks to his beautiful bright colours, and cheery little face! Amuseables is a stunning new range from Jellycat, featuring smiling faces and fresh fruit, inspired by the tropics! The range includes fashion and bag accessories, in shapes such as watermelon, pineapples, cactuses, and more!